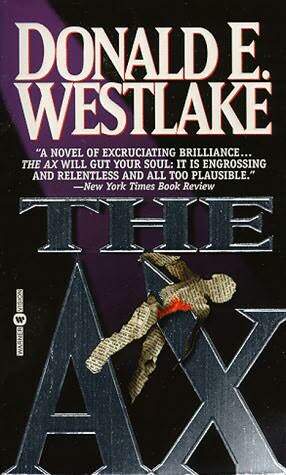 Donald Westlake’s death hit the crime story community hard, both writers and readers alike. My favorites of his were the Parker novels. I actually came late to them. You can thank Mel Gibson’s remake of The Hunter for that(I like Lee Marvin better in the role). Mysterious Press had a brief run publishing the early volumes and the new ones he was writing. When they stopped reissuing the early novels, I started looking for all those between and have managed to find reasonably priced copies of all but two. the Plunder Squad I read from my local library and Butcher’s Moon is just completely out of my price range. The Ax was one I hadn’t read and found on Amazon at a very reasonable price. They were offering a used book themselves, instead of brokering a used dealer, and I got a hardcover(Mysterious Press edition) for four bucks, no shipping & handling. An ex-library copy, it was almost like new. Well pleased with it. Burke Devore had been unemployed for two years and was starting to feel desperate. In an era of downsizing, he’d lost his middle management job simply because of cutbacks and transferring his division to a Canadian plant. In his early fifties, he sent out resumes for every job for which he was qualified, went on a few job interviews, but never hears anything back. It’s starting to cause problems with his wife and there’s a subplot with his sixteen year old son stealing software for his computer. His daughter is in college. When he reads about one man’s success in the exact type of job he once held, he devises a unique plan to change the status quo. He takes out an ad in trade publications purporting to be from a company soliciting resumes for his type of job. When they come to a P.O. box he’d set up, he goes through and winnows them down to six that would be serious competition and sets out to “eliminate” them first before he gets rid of the working man. He starts with an old Luger his father brought back from WWII, uses his car on one, and then has to try other means when the police compare bullets and realize they are tied together. All the while Devore is torn by what he’s doing. Am I becoming a serial killer? He justifies it all by rationalizing that’s he just doing what’s necessary to provide for and protect his family. Westlake’s skill turns Devore into a sympathetic character and makes one start to pull for the man despite his murderous impulses. You wonder if he can pull off this plan without getting caught. I can myself empathize with Devore. I’ve had some of the same thoughts he’s having(not the homicidal ones though). I’ve been through what’s happening to him in my life. His business was paper, mine was textiles, and I was downsized three times in my working life. The first company I worked for twenty-eight years, the second two and a half, the third three. I got all the classes about preparing resumes, all the polite platitudes from company management. I went to job fairs, I sent out resumes almost every day, went on a few job interviews, thought I might have a job every now and then, and finally having to take a step down just to be working. There was just too many people in my boat looking for work. They spoke of retraining, but I never felt that would work. I thought like Devore did on the subject. You apply for a job and a dozen guys with years of experience and one with a fresh certificate apply for a job. Who do you think they’ll hire? It’s happening again in this new economy. On TV the other day, they said unemployment in my county(9.3%) was the highest in the state and expected to get worse. It makes me glad I’m retired. So yes, I understand what Devore was going through. I don’t think his solution would have ever appealed to a normal person though. That’s what makes this book such an interesting read.It’s well worth looking for if you haven’t read it. I’ve also got the five Tucker Coes, of which I didn’t know about until I read on several blogs, speeding my way through the mails.